Most of the evils in my upcoming Science Fantasy game are beyond the players’ ability to confront directly. I want to have some manifestation or avatar for those evils that the players can be threatened by directly. When I saw Mantic Entertainment’s Plague 1st Gen miniature my thoughts went immediately to Phantasy Star’s Dark Force. In particular, the first Dark Force encountered in Phantasy Star 4. I had very ambitious plans for the Plague 1st Gen that included placing micro LED lights in it’s eyes. There’s a great tutorial on the subject at Crits Kill People. But after it arrived it was clear that I’m not there yet. I’ll probably try something like that one day, possibly with another Plague 1st Gen miniature, but for now I decided it was complicated enough just getting this one based and painted. If I do get ambitious I already know what color scheme I’d go with on a second Plague 1st Gen. I had to do a lot of work getting this miniature ready for painting. The mouldlines were hard to get without destroying the detailing and I used Kneadatite to close some gaps, particularly on the back shoulders. 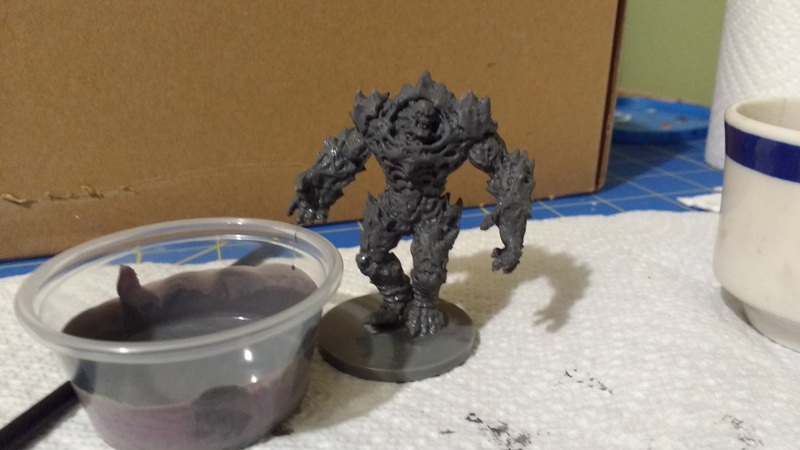 It was sloppy work with my X-acto knife and I wished that the sculpting tools I ordered had arrived…but of course I was too excited to wait for them! I feel like my enthusiasm is going to ruin more than a few miniatures. 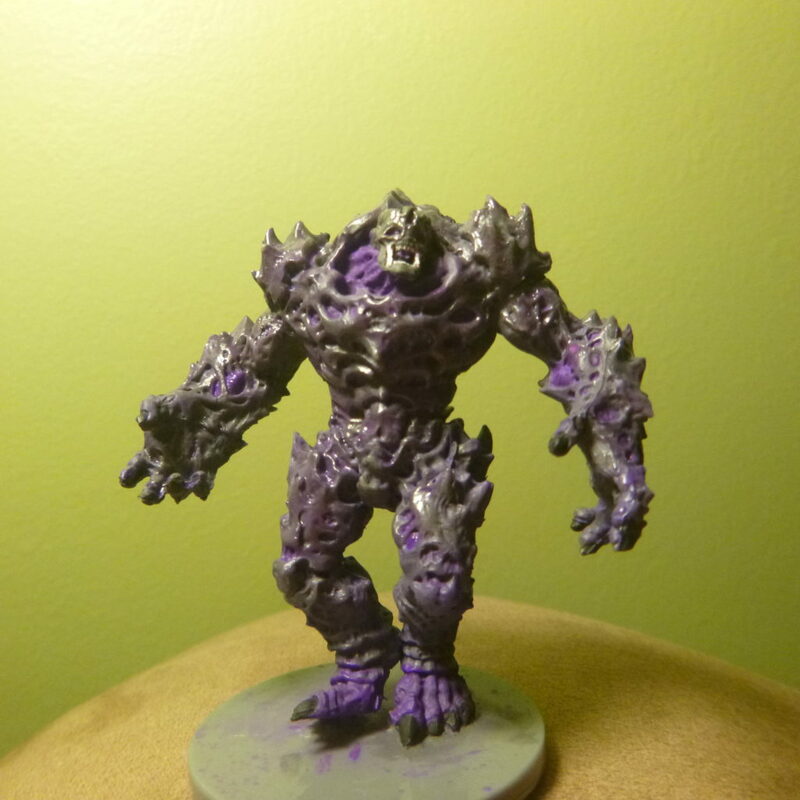 For whatever reason, Mantic Entertainment positioned this miniature’s feet very awkwardly. I ended up pinning one foot to the base, a process that was so straightforward and easy that I’m laughing at myself for having been intimidated by it! Pinning the foot allowed me to position the miniature more organically and really gave it some added stability. I usually take a look at other people’s paint jobs before starting on a miniature and I noticed that a lot of people had trouble with paint obscuring the details on the Plague 1st Gen. After getting the miniature in hand I could really see why. Most of the detailing is very shallow. So I mixed up a custom base coat and then thinned it considerably. I then applied the base coat with a spotter brush before going over each area again with a clean spotter brush to remove excess paint. I’ve noticed that the spotter brushes work great for base coating whatever plastic Mantic Entertainment uses but not so well for whatever Reaper Bones uses. Like I said before, I’m learning that each material really has it’s own idiosyncrasies. I took this picture while I was spotting off the excess base coat. The miniature was then left in this state as I headed into work. Plague 1st Gen getting some head alterations via Kneaditite to make it look a bit more like Phantasy Star’s Dark Force. Here’s after a first coat of paint on the alterations and a second purple wash on the miniature as a whole. I was amazed at what I managed to do with my X-acto knife and – MVP of the night – a pin. That’s right, I was too impulsive to wait for the sculpting tools that I ordered so I ended up primarily working on this with a pin. It was great except for that I kept on sticking myself with it when I used the round end to add texture. Tomorrow I’m planning to add highlights, probably using drybrushing as described in this guide, and then I’m need to decide how I’m going to varnish this thing. I also need to decide how to do the base… I’ll probably go with something simple unless I get impulsive again. The next day I dry-brushed in highlights with a light gray/purple mix but the results were barely noticeable. I thought about going over it again but I didn’t want to get overzealous and screw it up. I guess I’m more willing to be impulsive early in the miniature process rather than towards the end. I did some more detail work as well, touching up the purple and working on the face. I went with the simple route and painted the base a shiny black – I can always add details to it later when I get into more elaborate bases. The next morning, after all the paint was dried, I took the entire thing and DIPed it in polyurethane. I then spent about ten minutes patting off the excess with paper towels in order to preserve the details and color. And there is the final result. I still plan to do some more detail work once the varnish solidifies. I’d like to get the eyes to stand out more in particular. But, in general, I’m pretty happy with how this turned out. It was my most ambitious project yet and I tried out a lot of new techniques – pinning, drybrushing, sculpting with Kneaditie, and layered wash. 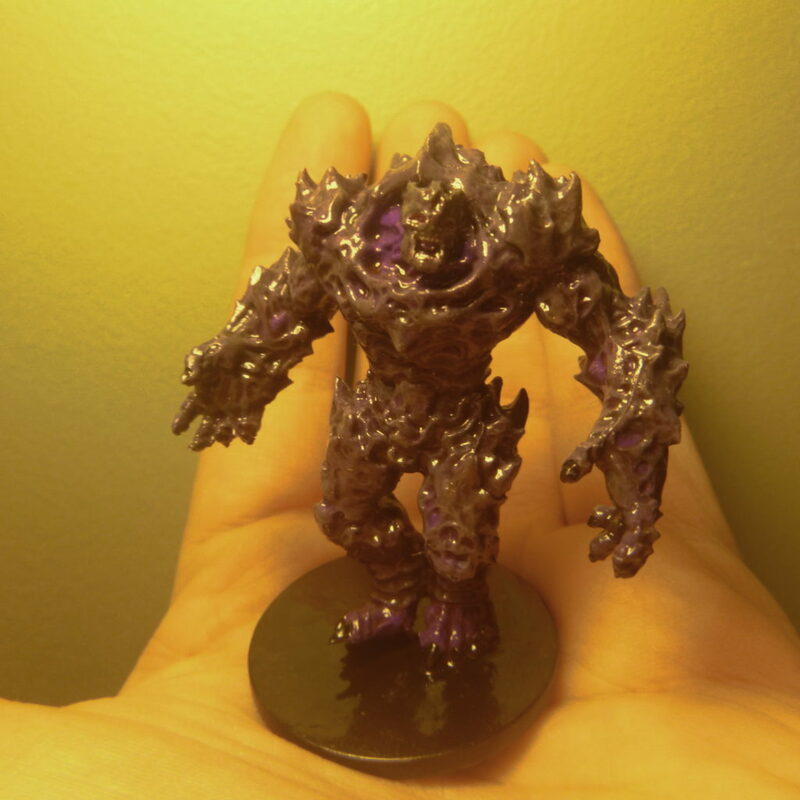 The miniature turned out nicely and I do like that you introduced purple a a second colour. Are you going for a glossy/slime covered look or will you apply a matte varnish on top of the polyurethane? Thanks for the comment. I definitely plan to go over this miniature and most of the others I’ve done so far with a spray on matte varnish… The problem is that I’m still a bit intimidated by the prospect. I had a bad time with spray on primer and I’ve read that I could end up frosting over everything if I mess it up. But most of them have ended up far too shiny and I like that it will further increase their durability, so I’m going to end up braving it eventually…probably at the risk of those practice rats first.